I have a bag o' apples in my kitchen, so many that they don't fit in a fruit bowl -- time to make a tea cake! Boil some water and soak 2 chai spice tea bags in 1/2 cup water. And while you're at it you might as well make another cup of chai tea to soak the raisins. Leave to soak/steep 15 minutes, remove tea bags, and strain the raisins. Beat ghee or oil, sugar and egg in a bowl. Stir in cooled tea, then apples and raisins. In a separate bowl, combine flour, baking powder, soda, spices and nuts. Stir into batter, mixing only until moistened. Scrape into a greased loaf pan. If you like, top the batter with apple slices. Bake at 350F for about 60 minutes, or until a knife inserted in the center comes out clean. Let cool slightly before removing from pan. Cut into squares. Makes 1 loaf. These would make great muffins, too! Just bake for half the time. Serve with (you guessed it) chai tea! To turn this light tea loaf into a rich, dark gingerbread spice cake, replace the cup of sugar with 1/2 cup molasses (jaggery) and 2/3 cup brown sugar. If you like, also add a few tablespoons of fresh grated ginger. You can keep the cup of chopped apples, or grate them instead to retain their moist sweetness without the chunks. Bake in a round cake pan. KAPHAS replace all fat with 1/4 cup ghee or sunflower oil; use quinoa, rice or tapioca flours; replace sugar with 3/4 cup fruit juice concentrate or prune puree; do not soak raisins; omit nuts. Batter will be extra juicy so add an extra 1/4 cup flour. What is the best way to print out the recipes on your wonderful site -- I'd also like to print out only 1 recipe at a time without colored ink. Okay, for printing black & white, I think that's an option you have to select in your printer settings when you go to print. If you want just the one recipe on the page, click on the recipe name and it'll open on its own page all by itself, but the links on the side and everything else will still be there. Or sign up to my recipe club and I e-mail you recipes as they happen! 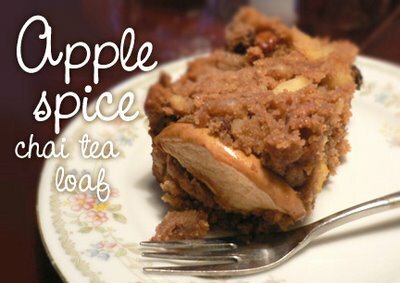 If you like I can just e-mail you this apple tea loaf recipe and you can print it from your e-mail program. so delicious! I love anything with cardamom. I followed the recipe, but used dried figs instead of raisins, and added some oatmeal and wheat germ for part of the flour. this loaf is delicious and about half the sugar of usual recipes. I just discovered your blog. Beautiful. what do you suggest I replace the egg with if I want to make this a vegan cake? A good substitute for 1 egg is 1/4 cup of water blended with 1 Tbsp ground flax seeds, and left to rest 10 minutes. It turns into an egg-white consistency. Half a banana mashed is also a good substitute but would not work well in this recipe. And if need be, just leave it out! In loaves and muffins, I don't find them crucial. Looks lovely and I'm heading out for ingredients right now! Plain or self raising flour?